When the kitchen renovation is always a question about how to hide gas pipe in kitchen. Unfortunately, this problem cannot be avoided. After all, even the most unusual and stylish interior it can ruin. There are several solutions. box for pipe, furnished with cavities for the tube. Close the pipe furniture. When assembling and installing the kitchen furniture, you can ask the collectors to make a kind of box on a pipethat will perform only an aesthetic function. This method is convenient because closing a pipe, it does not prevent access to it, because it is necessary for safety. Consult with the gasman. In principle, close the gas pipe can be anything, but not all the materials are safe. For example, to close the drywall is in any case impossible. The fact is that if there is a gas leak, it will accumulate in the space between the main wall and drywall, which will lead to an explosion, as the gas concentration in this case is sufficient. Plan your kitchen correctly. You even need to plan the kitchen so the pipes passed inside the kitchen cabinets. The disadvantage of this method is that the furniture will have to make cuts, but it needs to be in the lockers aren't built appliances or tableware dryer. Otherwise we will have from this method of planning to refuse. With safety in mind. We need to think not only about design and about beauty, but about the fact that everything is done safety. Let them suffer the kitchen than people's lives. In some houses not being allowed to close the gas pipe. The repair should clarify all these details. Consult with the designer. It is possible that he will suggest the best option for your kitchen. For example, it is good idea to order furniture manufacturers four panels. Two of them are set as side walls between the countertop and upper cabinets. 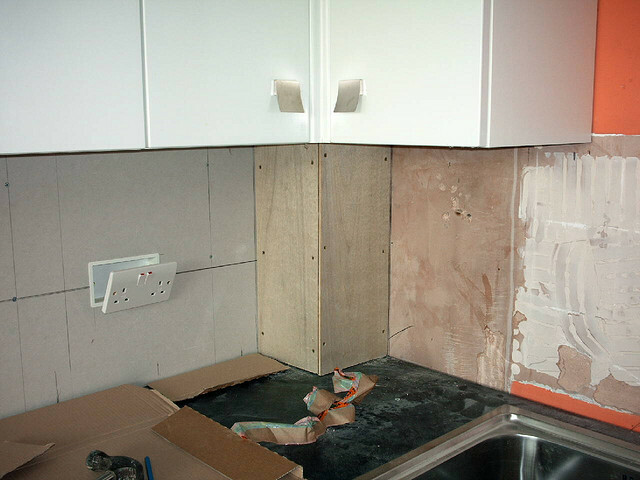 Between them on the countertop is installed the third panel. The fourth is fixed with hinges as a door. It has the same handle as the doors of the kitchen cabinets.